This is the latest post in my series on Fit for 2015 with healthy eating recipes and tips. You can find more posts, such as healthy chicken meatballs and chicken and bean stuffed peppers in my healthy eating section. My waistline still hasn’t shrunk all the way back from the the Christmas and New Year party season. 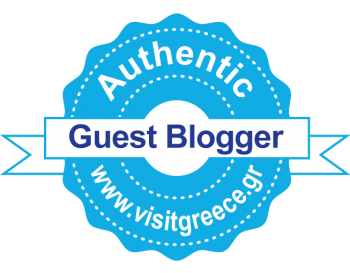 Since I started writing restaurant and event reviews on a regular basis I have been to launch parties with huge buffets of wonderful food, sumptuous French cuisine, decadent pancakes with caviar and much, much more. I have eaten some fantastic foods, and my always hungry stomach and ever eagre tastebuds just don’t seem to have a limit. What was needed was a course of healthy eating. 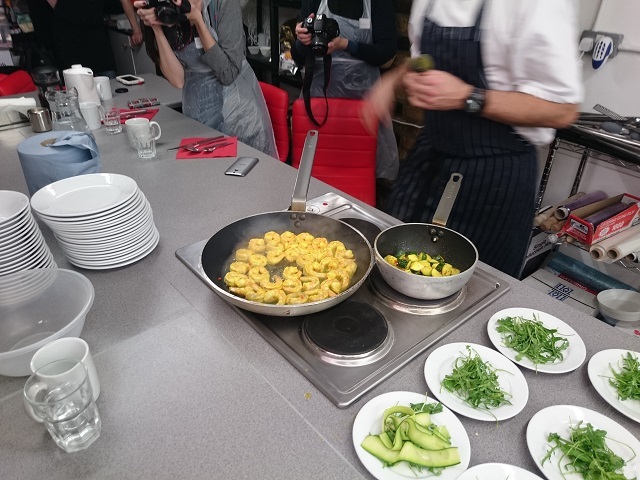 Luckily LV= invited me along to a healthy eating demonstration class at the Smart Cookery School, St Katherine’s Dock where I would learn to prepare several fantastically fresh and healthy asian inspired dishes. You can find great ideas on healthy living in their Love Life section with articles on recipes, smart fitness tech and even ideas for days out. They also have an article on the cookery evening on their website too. I had expected to be preparing the dishes myself so was a little disappointed that this was a demonstration rather than an more instructional class. I went to a cookery class a while back at L’atelier des chef by st Pauls where we did get to prepare all the dishes ourselves. 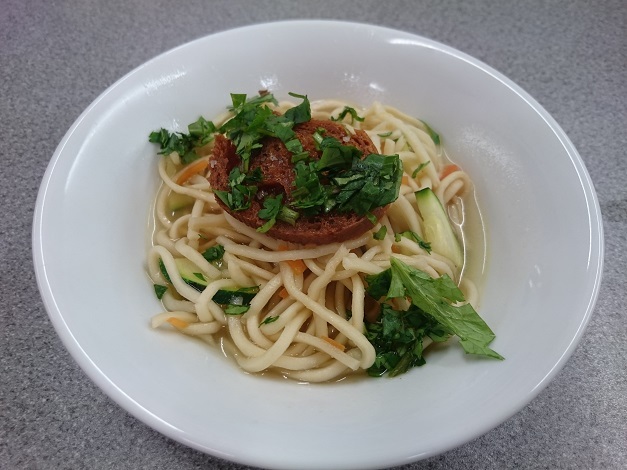 Thankfully we were all sent the recipes after the event and so I have been able to try my hand at preparing the dishes myself at home since then, and I think I did a pretty good job of it too! On towards the food! And I tried some absolutely great dishes at the cookery school, expertly prepared by the chef Stu. 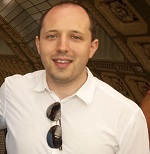 Stu originally trained as a pastry chef but has had a broad career cooking across the world before becoming a teacher at the Smart Cooking School. His broad and lengthy career had furnished him with a lot of great tips which Stu shared with us whilst we watched him demonstrate preparing the various dishes and I will share these with you as we go through each dish. 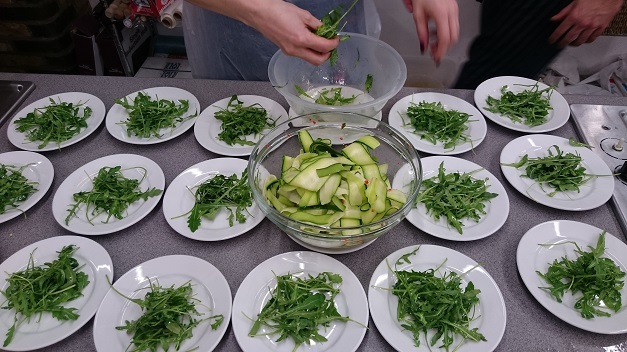 We started with lime and chilli cured courgette served on a bed of rocket. Raw courgette, either served as ribbons or turned into a kind of spaghetti is something I have been getting into lately so I eagerly chomped this down when we tried it. 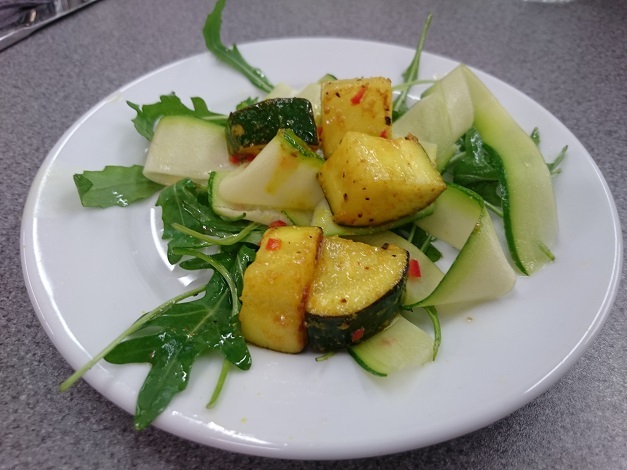 the courgette was prepared by curing it for 3 minutes in a simple marinade of 1tsp each of grated chilli, garlic paste and ginger along with the juice of 3 limes. Stu served the courgette simply on a bed of rocket. This is where chef Stu gave us his first tip of the day, keeping chillis and ginger in the freezer. It sounds a little odd but keeping them in the freezer means you can quickly grate them into your dish and keep all the essential oils, not losing them on the chopping board. The next tip was to only use sea salt not rock salt when cooking as it dissolves at the right rate and time in cooking. Next up was another simple dish, Asian prawns or in my case courgette. This dish was delicious and simple to prepare again. Stu whipped up the marinade and tossed the prawns or courgettes in it for a few minutes. The marinade was made of 2 tsp each of finely chopped chilli/garlic and grated ginger with the juice and zest of 2 limes, 1 tsp turmeric, 1 tbsp rapeseed oil and seasoning. The prawns, or courgette in my case were cooked quickly in a hot pan for around 3 minutes on each side then again served on a bed rocket and ribbons of courgette. This was my favourite dish of the evening and the first I tried preparing myself at home. It was served as a starter here but by bumping up the quantities I served it as a main course along with some brown rice for carbs. Here we come to our next set of tips from Stu, oiling food instead of the pan. You end up using less oil cooking this way, always good for those of us looking to lose weight and get in shape. Now on to our two main courses. This was an interesting dish which was served with a little crostini. In my opinion the chicken broth was really lovely but I felt that it didn’t need the crostini, essentially a giant crouton. I think this is nice in a western soup but it didn’t work as well in this. I know some of my fellow bloggers did like it, so it a matter of personal taste really. The chicken for the soup was cooked in a different way to what I would be used to but I think this really worked. The chicken was boiled separately before adding to the soup close to the end. Usually I may well have grilled or fried the chicken but boiling it first left it with a much more tender and juicy meat. We tried making this at home following the recipe and I will share this in the future, once I manage to find a little bit more time to write it up! 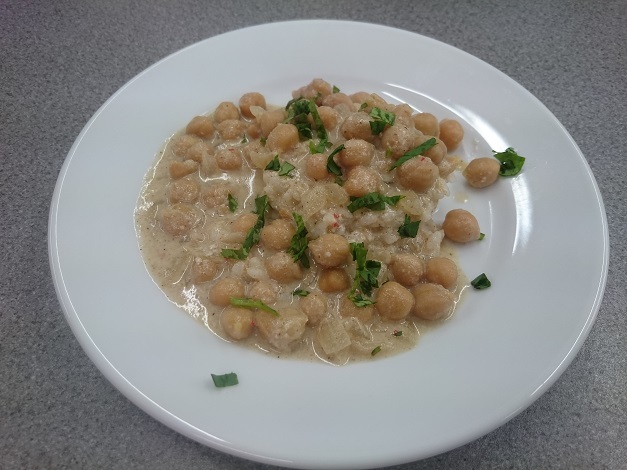 We finished off with the second main course dish, alternatively a chicken or chickpea curry. I ended my vegetarian (if not vegan?) meal with the chickpea curry. Again this was a really lovely dish, and one which I have to say was both a surprise and revelation. Why? I hear you ask. Well truth be told I don’t really like chickpeas. In fact I usually refuse to eat them, so why did I go for the chickpea curry? Well life is for living and pushing yourself and when the menu came through I decided to try something new, something I wouldn’t usually try. And in the end, I loved the curry and that is one less thing on the list of three foods I don’t like. The Smart School of Cookery is based in St Katherine Dock.